MyAmbit Account is your home to pay your bill, view usage and billing history and more! Log in now to open a whole new world. Does everything. Pay your bill. View details of your previous bills. Manage your paperless billing. Update your profile. Follow your usage history. Track your deposits… MyAmbit Account makes it easy. Just sign in or register above and see for yourself. Goes everywhere. Enjoy maximum access and convenience with our enhanced MyAmbit Account mobile app. Now you have instant access to a full range of account options with zero setup or apps to download. Plus, it works on all mobile devices, e-readers, tablets, computers and web-enabled TVs. 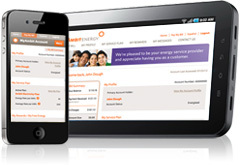 It only takes referring 15 new Customers to Ambit to start earning your Free Energy Credit every month. Now, we’ve made it even easier. When you’re speaking to interested friends, family or co-workers about switching over, you can send them an instant email from your MyAmbit Account with a link to join. Then, you get credit toward your 15 when they do. It’s that simple. Not an Ambit Energy Customer? We’re Here to Help. We’re glad you’re here. Would you like to find out more about our Rates and Plans or maybe view Ambit’s Service Areas? You may also be interested in learning more About Ambit Energy or even how to Start Your Own Business. If you have other questions, feel free to call our Customer Care Team at (877) 282-6248 Monday through Friday, 8:00 a.m. to 6:00 p.m. and Saturday 10:00 a.m. to 5:00 p.m. CT. Licensed in CT, DE, DC, IL, MA, MD, NH, NJ, NY, PA, RI, VA & TX With service in CA. (DC #GA11-8-6, MD #1R-1992, MD #1R-1993, NJ #GSL-0110, NJ #ESL-0111, TX #10117).